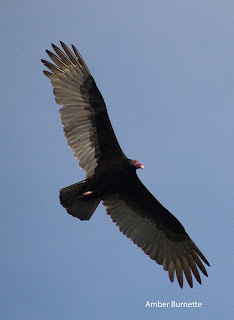 The Raptor Center: Baby Raptor Species is a Turkey Vulture! Turkey vultures, the only nesting vulture species in MN, usually choose remote sheltered areas such as rock crevices, caves, hollowed logs or abandoned structures to raise young. One pair decided to take advantage of a wood shed canopy in Marine on the St. Croix. With a pristine river view and quiet landscape, it seemed like the perfect spot, at least until the property was put up for sale and the serenity disturbed by visits from potential buyers. The female vulture, brooding its single chick, spooked off the nest and left the vulnerable 4-5 day old youngster exposed. Found by some children, the chick was taken to TRC and immediately placed in a 90 degree F incubator to provide it with the warmth it needed. Due to the high level of activity at the recovery site, it was decided that the youngster could not be reunited with its parents. TRC staff quickly networked with a licensed WI rehabilitator who already had two permanently disabled vultures that have raised babies in the past. 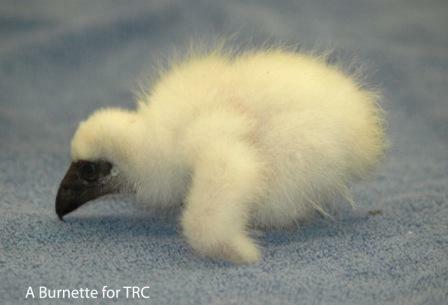 So, a few days after arriving, the vulture chick, now warmed and eating well, was transported 4 ½ hours west on the wings of compassion by two dedicated TRC volunteers to its new parents in WI. The adult vultures immediately bonded with the chick. The foster adults are permanently disabled birds that have helped raise orphan vultures in the past. They immediately took their new charge under their wings and raised it to be a hissy, feisty, ground stomping juvenile – all traits that are desirable if you are a young vulture!